A little snake bile can go a long way….. If you are treating cancer. 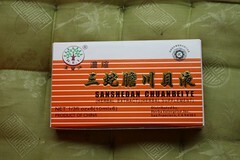 SanSheDan ChuanBeiYe is one of my primary herbals I use for cancer treatment. It is a Chinese product marketed for use as cough syrup and contains three herbal/animal ingredients in a sugar solution. The primary ingredient in SanSheDan is apricot seed or Xing Ren. It also contains fritillary bulb (Chuan Bei Mu) and snake bile. Many of my clients refer to it as snake oil but it really does work. It is especially helpful for animals with cancers which tend to migrate to the lungs. I always use this in my osteosarcoma dogs but also use it for treating many other cancers. In fact, I have not found a better product for keeping cancer out of the lungs. If we can catch the cancer before there are detectable lung mets on X-ray, this product will usually keep it that way. In Chinese medicine terms this formula is directed towards the lungs. The snake is moving and helps to move the apricot seed into the lungs and keep things open. The apricot seed is a lung tonic and helps to open up the lungs and kill cancer cells. The fritillary gets rid of phlegm in the lungs and reduces nodules. Apricot seed contains a bound form of cyanide. This form of bound cyanide is much more toxic to cancer cells then normal cells. This supplement in the first of a series I will talk about where toxic compounds in small amounts can lead to better health if used correctly. Taken in recommended dosage I believe this herbal to be extremely safe. However it should not be overused – more is not better and in large dosages this product can kill. It also should never be given to pregnant or reproductive animals who may become pregnant. 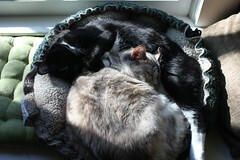 In small animals I dose this supplement at 1ml per 10lb of body weight per day. In most dogs of average size I dose it at one vial (10ml) twice a day. If they are much over 100lb I will increase that to 1-1/2 to 2 vials twice a day. Because it comes in glass vials with a straw for sucking it out, you need a large needle and syringe to remove it. Often your vet is willing to provide this. It can be given in food or squirted directly into your animal’s mouth. I have never had an animal have a negative reaction to this product at this dose. As with all health advise given on this site, please check with your animal’s primary veterinarian before using this product. This entry was posted on Sunday, March 13th, 2011 at 5:24 pm	and is filed under cancer book, health. You can follow any responses to this entry through the RSS 2.0 feed. Both comments and pings are currently closed. Can I ask about dosage for Pietra – she is 42lbs. Also is there a difference between SanSheSan ChuanBei Ye and SheDan ChuanBei Ye? I am thinking that SanShe has three (she) main ingredients where SheDan does not? I use 1 vial twice a day for any dog of average size, like Pietra. SheDan seems to also contain menthol and a couple preservatives (including a paraben) which you don’t need. Sanshedan means three snake gallbladders, shedan is snake gallbladders without the three in front. San is three, she is snake, dan is gallbladder. Seems the lack of three means more than three ingredients in this case.